Star Wars fans are currently on edge waiting for the release of the third installment of Star Wars movies, this time produced by Disney and directed by J.J. Abrams. The original Star Wars trilogy was a masterful work of cinema, but the three more recent movies, directed by George Lucas, can be described at best as filling in the Star Wars narrative, and at worst as Lucas flinging Bantha poop at your childhood memories. 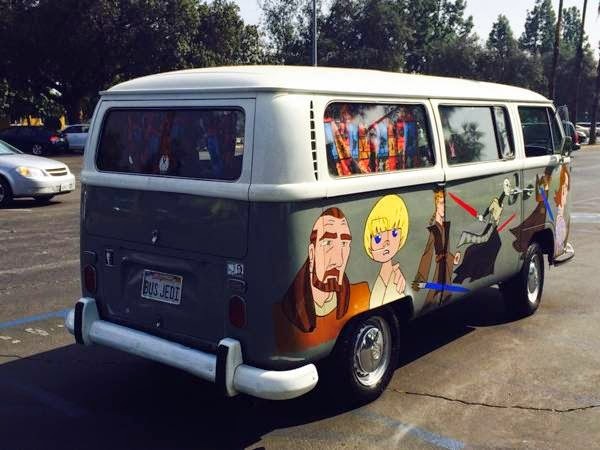 Episodes 1, 2, and 3 were really horrible movies (in a category with the unwatchably mesmerizing Star Wars Holiday Special) so why you would choose to decorate your 1971 Volkswagen Van with images from those abysmal films is completely lost on me. 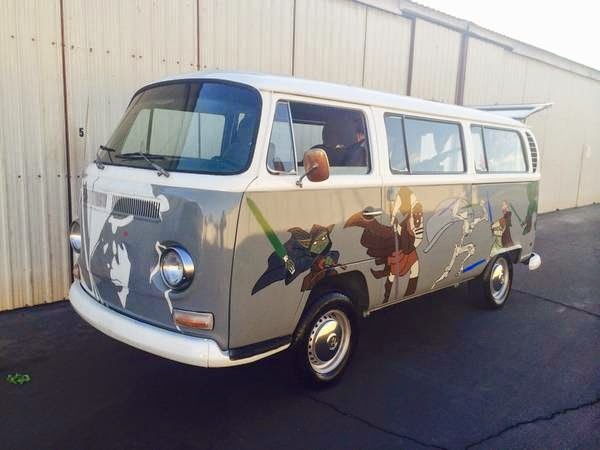 Find it here on craigslist, located in Los Angeles, CA for $7,900. It is poignant that each time you fill up, you're going to pour gas in Anakin's youthful eye, because the actors portraying the troubled Jedi was one of the main issues with Eps 1, 2 and 3. Young Jake Lloyd and slightly older Hayden Christensen delivered performances that have been rivaled by sea anemones, which also have more onscreen chemistry with Natalie Portman. How do you mess up a film with Natalie Portman on screen? 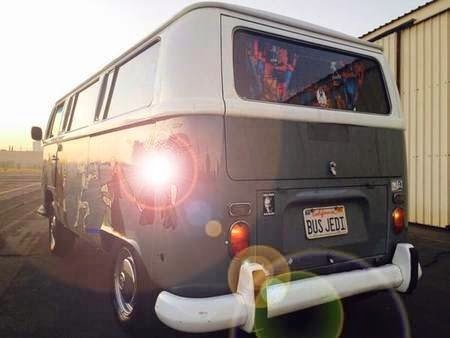 Perhaps more blame should be dumped onto the director (Mr. Lucas) because acting greats like Liam Neeson and Ewan McGregor also deliver lackluster performances reminiscent of a '70s VW Bus at the drag strip. It is going to be a long and painful 2 1/2 hours. Bring ear plugs. And a flask of gin. Upon further inspection, it looks like this car might be a tribute to the animated Clone Wars TV show, but that doesn't forgive its depiction of the General Grievous, the droid with emphysema and a predilection for spinning light sabers like nunchucks. Ironic that Episode 1's fantastic villain, Darth Maul, was light-sabered into two pieces in the first movie and replaced with ambiguously bad but horribly acted Count Dooku (played by Christopher Lee who is not a bad actor as seen in Horror Express (1972), his portrayal of Scaramanga in The Man with the Golden Gun or his recent work in the Lord of the Rings and Hobbit trilogy(s) as Saruman). In Episode III, the good guys fight the droid General (android?) who wields light sabers like a teppanyaki chef at Benihana and dresses like a comic con reject. 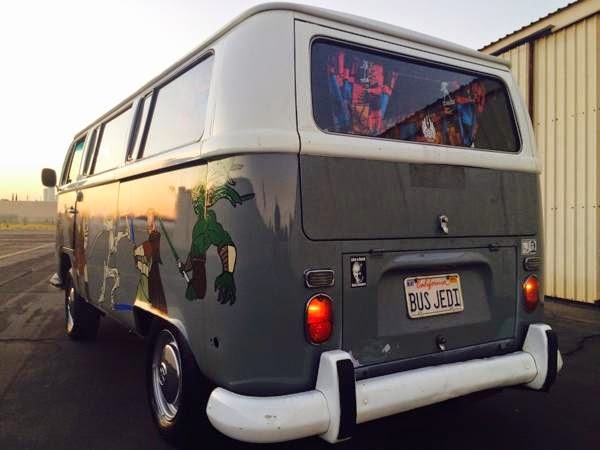 If you are even a passing fan of Star Wars, this Jedi Bus should pique some interest, but does the emphasis in Ep 1,2 & 3 make it just uncool? 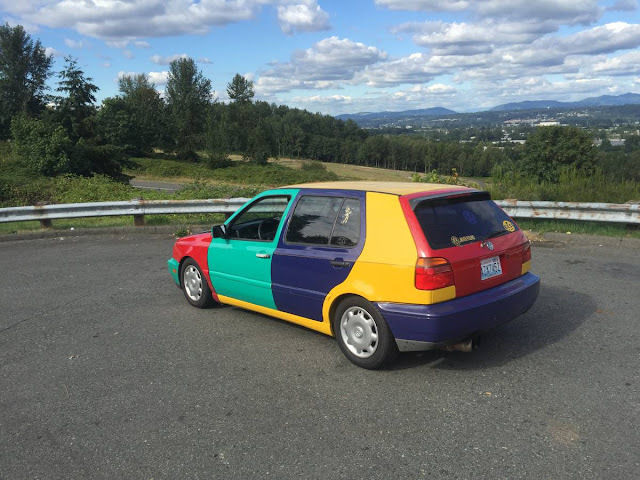 Or is this paint job so uncool that, like the hipster's jacket, pants, tie, hat, glasses (et cetera), it becomes cool? Wow, just think of all the girls you are going to get by driving this baby! Does the girlfriend I created in Minecraft count? Hey you should really add some lens flare on that last picture.